Instruments used to measure the electrical impedance are called impedance analyzers. in this context to avoid confusion with the symbol for electric current. later with respect to the voltage signal).
. The identical voltage and current amplitudes indicate that the magnitude of the impedance is equal to one. , and that the AC voltage leads the current across a resistor by 0 degrees. is the real part of impedance; a device with a purely resistive impedance exhibits no phase shift between the voltage and current. between the voltage across it and the current through it. In general, neither impedance nor admittance can vary with time, since they are defined for complex exponentials in which -∞ < t < +∞. If the complex exponential voltage to current ratio changes over time or amplitude, the circuit element cannot be described using the frequency domain. 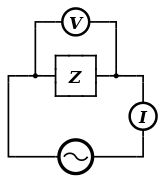 However, many components and systems (e.g., varicaps that are used in radio tuners) may exhibit non-linear or time-varying voltage to current ratios that seem to be linear time-invariant (LTI) for small signals and over small observation windows, so they can be roughly described as-if they had a time-varying impedance. 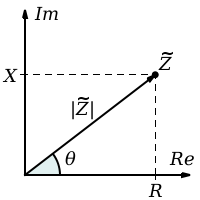 This description is an approximation: Over large signal swings or wide observation windows, the voltage to current relationship will not be LTI and cannot be described by impedance. ^ Horowitz, Paul; Hill, Winfield (1989). "1". The Art of Electronics. Cambridge University Press. pp. 31–32. ISBN 978-0-521-37095-0. ^ Horowitz, Paul; Hill, Winfield (1989). "1". The Art of Electronics. Cambridge University Press. pp. 32–33. ISBN 978-0-521-37095-0. ^ a b George Lewis Jr.; George K. Lewis Sr. & William Olbricht (August 2008). "Cost-effective broad-band electrical impedance spectroscopy measurement circuit and signal analysis for piezo-materials and ultrasound transducers". Measurement Science and Technology. 19 (10): 105102. Bibcode:2008MeScT..19j5102L. doi:10.1088/0957-0233/19/10/105102. PMC 2600501. PMID 19081773. Retrieved 2008-09-15.